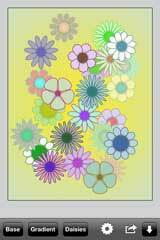 Generate lots of MOVABLE decorative DAISY SHAPES at once. Change background GRADIENTS. Add LEAVES. Move or delete any daisy. Make the area outside scenes lighter or darker to change perception. Hide the toolbar. Remove any background gradient leaving just the base colour. 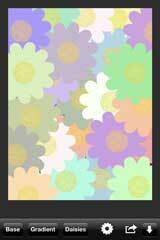 Change the background base colour by tapping. 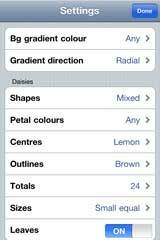 Delete all daisies in one go. 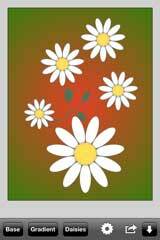 Choose your own petal colour for the next set of daisies you generate. Save a scene to the Camera Roll as a jpg file (resolution 576x768). Copy a scene, or just a single daisy, to the clipboard. Copy a scene with the background made fully transparent. An iPad version of this app is available. 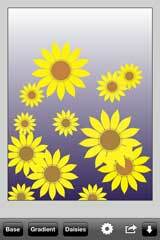 Go to DaisyScene for details.